What are you looking forward to most in the upcoming week? Do you have any major goals you’re working toward? Whether I’m talking with an old friend or getting to know someone new, I like to ask these questions. It’s a good way to get to know people better. The way they answer is a gauge of their current state of happiness. Some people light up and describe in vivid detail the vision they’re executing. Others hunch forward and tell stories about of how and why their happiness has been put on hold indefinitely, often because of the noble sacrifices they’re making for others. 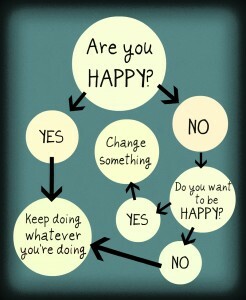 When is the best time to do something that makes you happy? The best answer is “now,” and “today,” or “ASAP.” Now is the only time you have and this is true every single day. Your life is happening now right in front of your eyes. Look around. It’s passing by even when you aren’t paying attention. Many people miss the power of the present moment because they’re too busy lamenting over the past or projecting into the future. The more you can discipline your mind to stay in the present, to take actions now to design the life you want, the more likely you are to smile more and complain less. You may admire others who have more money than you, travel more than you do, have better jobs, more fame, or bigger or better whatever. You may think you want what they have, but you really don’t know until you take the opportunity to experience it personally. You don’t know how well it will fit until you try it on or walk in their footsteps. If you did, it might surprise you. Lots of people take time to check in with Facebook, TripAdvisor, or Yelp, but forget to check in with themselves. When you feel your mood swinging up or down, make a conscious note of the trigger. Self Check-In. This is a good time to take a moment to reflect on what habits, goals or resolutions you need to make in order to create more emotional up-times in your life. You know you’re getting closer to happiness when you no longer notice the small things that are less relevant because you’re too busy doing what you love to do. If you have time to slow down and reflect on Sundays, for example, you can reflect back on what went well the prior week and what you want to do different in the upcoming week. Are there new habits you need to put into practice? I love Google Keep for tracking habits or things to do. You can add photos that help you visualize what you want. And you can add checkboxes that you can reset every day, ever week, or whenever you want. It can take about 21 days to acquire a new daily habit, so don’t give up if you miss a day. Just pick up where you left off on the next day. Over time your new habit becomes so engrained in your subconscious that you begin to do it automatically. And when you don’t do it, you miss out on the benefit it provides, which makes you want to go back to doing it. This is The Power of Habit . Reflect on your smaller short-term goals each month. Are you doing what you need to do on a daily basis? The first day of the month is a good time to begin tracking your progress throughout the month. If it’s the 10th day of the month, then you know you’re about 33% there. You can also use your birthday as a milestone instead of going with the first of the month. It feels a bit more personal, even though it can take a little longer to calculate progress. If your birthday falls is on the 29th, 30th, or 31st, you may need to use the last day of the month as the fall-back date for the months that don’t include your number. 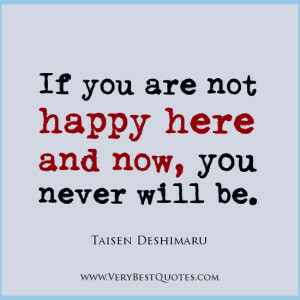 What do you think you need to do to be happier? Try a 30 day challenge. Check out this clip by Google Webspam team member, Matt Cutts . . . Some people like to set New Year’s Resolutions. But you shouldn’t wait for the New Year to come around to kickoff a big goal unless you’ve been preparing yourself for it throughout the prior year. Most people don’t keep their New Year’s Resolutions because they aren’t in the habit of setting small goals all year long. They don’t have the habit of making and keeping promises they make to themselves. If you don’t set and accomplish small goals throughout the year, you’re not likely to accomplish big goals that you blurt out once a year. The most common type of New Year’s Resolution in the US relates to losing weight, exercising more or getting healthier one way or another. Most people have a general idea of what they need to do to be happier, but don’t have the mental will-power to do the day-to-day mundane things that ultimately lead to big results over time. Happiness is as much about the journey as it is a destination. Sick of diets? Film Diet Plan will help you escape the fat trap. People who keep their New Year’s Resolutions tend to set smaller goals year-round and, more importantly, they keep them. Their smaller goals support their bigger vision. They write down their goals and schedule the daily and weekly activities that direct them toward their ultimate vision. Every day is the first day of a new year. Today is the first day of the upcoming 365 days. Consider birthdays, anniversaries and holidays. They can fall on any day of the year. When that day comes around the following year, it’s the beginning of a new year relative to that date. 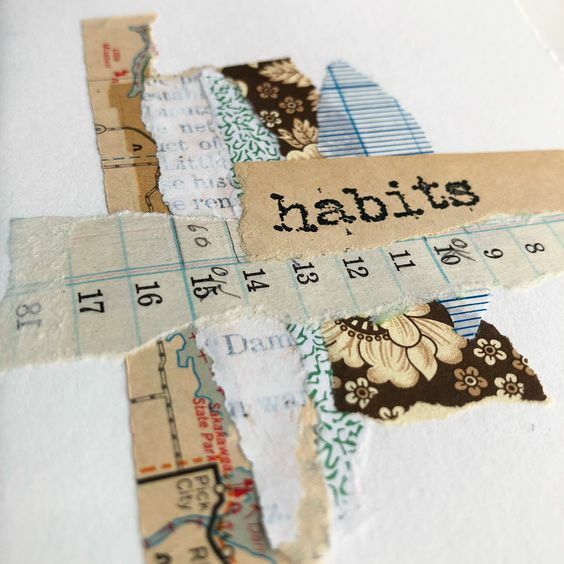 Every day is a good day to make adjustments to your habits and routines in order to create the relationships and environment that bring out the best in you. If something doesn’t go the way you want it to today, start over again as soon as the sun rises. It’s natural to want to move forward and experience life in a fuller way, whatever that means for you. It’s human nature to want expand your space, your influence, your desires and even your things. You can try to do this vicariously through TV, movies and even social media, but if you really want to make the most of your reality, you’ll reach your goals much quicker by spending less time wallowing in passive entertainment and more time taking action to help them to manifest in your life. Tidy up to free up more time and space for what you want most. People often set goals that are too time-consuming or disruptive to their current lives without deciding what no longer adds value. The hours of your days are already full, so you’ve got to let go of less important activities in exchange for the new. Tidying up, in itself, can often relieve you of financial and mental stress which may result in greater happiness. Connect with others who share your driving interests. Technology has made it easy to find people who share your passion. Search for clubs or MeetUps in your area so you can build friendships with like-minded friends. Not knowing what to do next is like a having a clogged drain in your brain. You feel stuck, but can’t seem to get past it. When this happens, you may need to get advice from a mentor or someone who has already done what you want to do. I use Todoist to track my next actions and daily tasks. In his blockbusting bestseller on productivity, David Allen talks about the power of sorting things out based on the next action. Negotiate small ongoing changes with others. As you make changes to your life, you’ll often face resistance from those around you who don’t understand what’s going on. If you’re persistent about making adjustments on a regular basis, then people have time to adjust their own habits and attitudes as they see your progress. Happiness is not accomplished by amassing a large number of things. If you’re passionate about gardening or animals, you may want to let go of some of the things you have in order to acquire some land. If you want to go off the grid, you may need to invest in a new home or a renovation to make this dream a reality. The same holds true for any passion you might have. Let go of unnecessary possessions and self-defeating habits one by one in order to make more room for happiness. Don’t wait. Do it now. Once you awaken to the possibilities, you begin to realize that no one but you is holding you back.